Okay, so you've played around with some hobby Hydro systems and now you've started thinking about going pro? You've seen the pictures... Rows and rows of clean, prolific tomato vines, nestled in a beautiful, climate-controlled greenhouse. And maybe you're thinking… I could do that! Well, you need to give careful consideration to the amount of work and possible risks involved before you take the plunge. Below, we provide some serious "food for thought" for you to ponder as you form your business plan. ~ Operation is easily expanded by adding green houses and hydroponic modules. Contact us for more information on these Amazing Turnkey Vertical Farming Systems! ~ Hydroponic produce cannot be certified as organic in the U.S.
~ Commercial hydroponics farms are most profitable in areas with drought conditions and/or infertile land. Do not set up shop in a rural area where tomato, cucumber and lettuce farms prosper. ~ Hydroponics today is a niche food industry, driven by consumer demand, commonly in upscale (urban) food markets. The demand for hydroponic vegetables has risen dramatically in those markets. ~ Do your homework by experimenting with different hobby-sized hydroponic systems until you thoroughly understand the process. You must have success with small gardens before you ever consider going commercial. ~ Plan and implement methods to reap the highest possible yields in the smallest amount of space; either grow up in the air as high as possible, or low-growing crops densely spaced. Both must be continuously harvested and replanted. ~ If you don't have a love of farming and a passion for hydroponics, do not set up a commercial system. ~ As with any new business, you must have the entrepreneurial spirit, determination to overcome all obstacles and a clear vision (business plan) if you hope to succeed. ~ Commercial hydroponic gardening requires an enormous amount of work. This is not a part-time job. Below are some quality, affordable professional Hydroponic farming systems that we offer. Please Contact Us for Details, shipping, and the best price on the 'Net! We also offer outstanding Commercial Greenhouse Kits! This NFT system produces lush, clean, healthy lettuces on a 6-week grow cycle. This system is specifically designed to create an easy to operate, complete NFT system for leaf/bib lettuce, herbs and more. A virtual lettuce factory! Quality hydroponic produce is in high demand, cash in on the growing market. Ready to go pro? The FarmTek Pro and Commercial Hydrocycle NFT Lettuce Systems are ideal for modest farms up to large-scale greehhouses. Go pro with a commercial float bed, ideal for leafy greens, including lettuce, Swiss chard, kale and herbs. This is probably the simplest hydroponic system you could go with. The plants are suspended on a styrofoam raft while their roots dip into the nutrient-rich water below. Customize the spacing of your plants by drilling your own holes in the float bed. 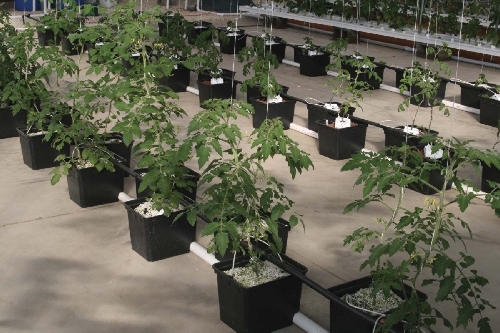 Create the ideal greenhouse tomato or pepper farm with Dutch "Bato" Bucket Top Drip Systems. We offer complete gardens that are automated, and do all the work for you. Price includes patented buckets, reservoirs, timers, all plumbing. Vertical gardening systems are "Tailor-Made" for the most productive commercial greenhouses you could ever imagine. "Growing UP" allows maximum produce from minimum space. We highly recommend and sell the the professional/commercial vertical garden shown above for a greenhouse operation. Hydrocycle Aeroponics Garden offered by Farmtek. Read all about the Aeroponics (fastest turnaround time) Vertical System here. Need room for your new hydroponics farm? Read up on commercial greenhouses.